Republic of Karelia is located in the north- and mid-taiga subzones. Forests occupy over 50% of the total area, mires - over 20%, meadows - about 1%. 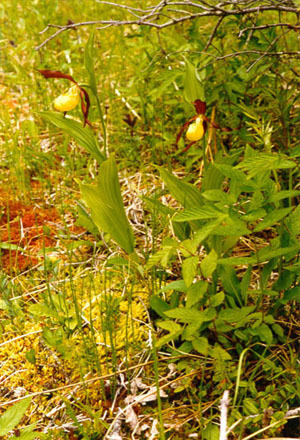 The problem of plant species diversity conservation remains one of the top priorities in the areas exposed to continuous effect of anthropogenic factors. Tens of thousands of hectares of forest are cut down annually, including the last, westernmost in Europe patches of primary boreal forests. 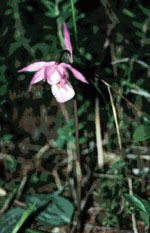 The disappearing forests are followed by the typical taiga flora. Most dramatically affected are rare and scarce species which join the group of endangered and most vulnerable species. 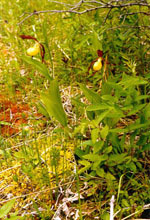 The vegetation cover of Karelia is represented by 1379 vascular plant species of which 18 are included in the Red Data Book of Russia (1988): least grape-fern Botrychium simplex, quillwort Isoetes lacustris, bristle club-rush I. setacea, brown beak-sedge Rhynchospora fusca, livid sedge Carex livida, weak sedge Carex laxa, yellow lady's slipper Cypripedium calceolus, eastern fairy-slipper Calypso bulbosa , ghost orchid Epipogium aphyllum, narrow-leaved marsh-orchid Dactylorhiza traunsterneri, an orchid Dactylorhiza baltica, fen orchid Liparis loeselii, fly orchid Ophrys insectifera, bog-myrtle Myrica gale, rock campion Silene rupestris, spring pasqueflower Pulsatilla vernalis, a cotoneaster Cotoneaster cinnabarinus, water lobelia Lobelia dortmanna. Three of the species in this list (Botrychium simplex, Dactylorhiza baltica, Ophrys insectifera) were classed as presumably extinct (Red Data Book of Karelia, 1995); a few more species were included in categories 1 (Х) - endangered, and 2 (V) - particularly vulnerable. The species composition of mosses in Karelia is not sufficiently studied, and no reliable data is available on even the rough number of species growing in the territory. Cormophytic mosses, noted for the highest diversity, were found to be represented here by 430 species, of which 86 are included in the Red Data Book. Karelia has 965 species and intra-species taxa of lichens and lichenized fungi. The final list of rare lichens of Eastern Fennoscandia recorded in Karelia currently includes 91 species. So far, 272 species and forms of fungi have been found in Karelia. Their relationships with woody species were determined. Edible mushrooms make up 59% of all species, inedible fungi - 12%, poisonous - 8%. 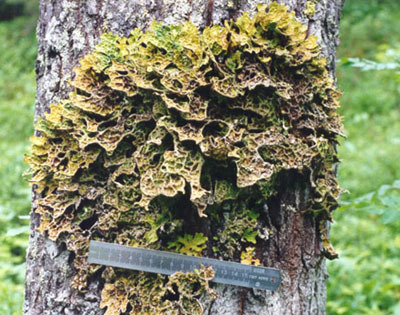 The properties of 21% of the total number of fungal species are not known yet.